Susan and Mike Loosen were avid supporters of their community of Okarche, Okla. After their death, their daughters utilized the assets from a life insurance policy to establish an endowment fund at the Oklahoma City Community Foundation to continue supporting the organizations their family is passionate about. Originally from Kansas, Susan Loosen moved to Okarche, Okla. after marrying Mike Loosen in 1968. A graduate of the University of Kansas, she and her husband established several businesses in the community. In 1980, Mike succeeded his father as president of the First Bank of Okarche, which was established by the Loosen family in 1892. Following Mike's death in 1987, Susan assumed the role of president of the bank until her retirement in 2009. Today, the Loosens' three daughters all serve on the bank's board of directors and daughter Lisa Loosen Mullen is chairperson of the board. Susan was very active in the community, serving on the board of directors for the Oklahoma Medical Research Foundation, Holy Trinity Catholic Church and the Center of Family Love, a residential care facility for adults with developmental disabilities. She was also an avid sportswoman and enjoyed trapshooting and game hunting. Susan died in 2010. 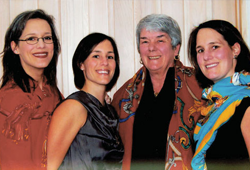 As beneficiaries of her life insurance policy, her daughters used the assets to establish the Loosen Family Gift Fund at the Oklahoma City Community Foundation to support a number of charitable organizations that Susan was passionate about. "Our parents had always been active in our local community and taught us from early ages about the importance of volunteering time and contributing money to causes we believe in," says Fran Loosen. "The Loosen Family Gift Fund is a way for our family not only to honor our parents' legacy, but also to work together to support the communities in which we live."